Swirl marks quickly make paintwork look dull and tired. Particles of dirt and grit get caught in the wash mitt and the wiping back and forth motion drags them across the clearcoat, which quickly loses its shine. To prevent this from happening as much dirt and contamination needs to be removed from the car before a wash mitt comes into contact with the paintwork. 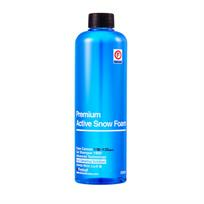 Active Snow Foam is applied through a foam lance connected to a pressure washer to create a thick creamy lather that clings to vertical surfaces. As the bubbles expand they lift the larger particles of dirt and grit away from the paintwork. These can then be easily rinsed away before a mitt is used to wash the car.